While searching for a picture for my Pinterest “Food Pic of the Day” board, I found this great post! It's filled with fantastic pictures showing really clever and simple things you can do with food to bump up the flavor. I have a feeling I’ll be trying most of them! The one idea I couldn't wait to try (because the picture looked so damn good) was filling a sugar or waffle cone with fresh fruit and yogurt! Unfortunately my first attempt didn't go so well. 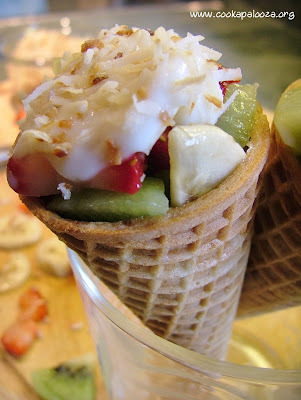 I simply loaded a sugar cone with sliced kiwi, fresh strawberries and banana slices and then topped it with a spoonful of low-fat vanilla yogurt. I also sprinkled on toasted shredded coconut that was leftover from a cooking event I did not too long ago. It was ok, but once you got past the yogurt and sweetened coconut on top the rest of the cone was a bit of a letdown. My second attempt was better! I went into "layering" mode and placed just enough sliced fruit in the cone to fill it halfway. Then...I spooned in the yogurt, sprinkled on the shredded coconut and that left me enough room to add a second layer! I would have gone for a third layer but my waffle cone couldn’t handle it. Layering was good, but I had one more idea (good thing I had a lot of cones)! This time, after I added the first layer of fruit, I drizzled on honey (fruit looks sooo, sooo good covered in honey)! I followed it up with the yogurt and coconut then added the second layer using the same approach. With the layering and the honey you get sweetness all the way down to the bottom of the cone! It tastes way too good to be good for you! Keep in mind the sugar cone is no super-food, but that doesn’t matter much when it packed with nutritious healthy fruit! P.S. – After taking the pictures, I also tried topping it with whip cream. Yeah…that’s really good too! Make this recipe with LESS effort! Fill each waffle cone halfway with equal amounts of strawberries, kiwi and banana. Drizzle 1/2 tbsp honey over fruit in each cone. 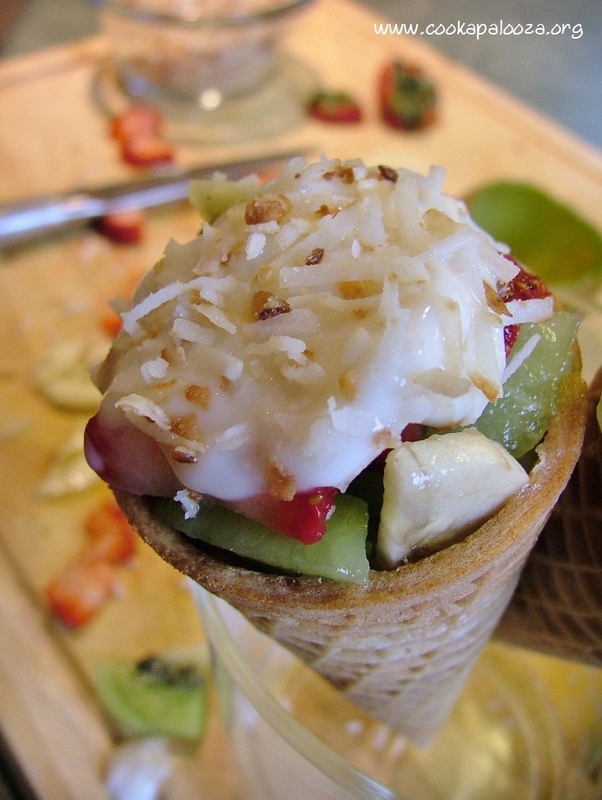 Top fruit in each cone with 1 tbsp yogurt followed by 1 tbsp coconut. Repeat process to add a second layer to each cone. By the way...I hope you like the new look of the blog. Been trying to tidy things up around here!